Want to Experience Great Fun? Take the Digital Detox Holiday Challenge! Are you taking a leave this coming weekend?If you want to take a break from all the stress in your job and traffic in the metro, you should consider having a digital detox holiday! Do you want to amplify your plans and anticipated experiences? What is Digital Detox Holiday? Modern technology evidently brings convenience and other significant benefits to our daily activities. In the past years since the bourgeoning of technological advancements, we have established a solid dependency to utilizing mobile phones, tablets, and laptops. These innovations provided a mindset that going online can keep us constantly in the loop and connected to the world. Back in the days, we read the newspaper and tune in to our television set for current events and global news. Now, we surf the Internet for traffic updates and latest happenings not just in our country and worldwide. Before, we wrote letters to our loved ones to stay updated. Nowadays, snail mail is obsolete because text messages and emails are the modern and fast communication medium. Back then, we hangout intimately through conversations over coffee to catchup. Today, social media is one big daily reunion happening in the cyberspace. Because of the wonders of the digital age has to offer, we aren’t aware that these modern mediums have foreshadowed downsides. While technology is created to innovate our daily lives through ease of access and other forms of modern convenience, we are most of the time distracted from what we actually need to do at work, at school, at home. Also, there is an obvious irony that we aren’t paying much attention to. Being active in social media keeps people from socializing in real life. Even when we take a break from all the daily living’s hustle and bustle, say for instance on an out-of-town trip, we still tend to go online to check emails for work or update feeds on our current whereabouts. A number of people nowadays are opting to steer clear away from all the buzz of technology by disconnecting with an aim to refresh themselves through meaningful experiences grounded in reality. This is the concept of digital holiday. This project aims to make people realize what it is to really be ‘connected’ – not in the technological sense but in life in general. Digital holiday is about making a vacation count, making every minute of hiatus substantial. This helps you retrieve yourself as you are giving yourself a deep reset from all the worries of living. Establish your goal and stay firm with your decision to take the challenge. Remember that a digital holiday is important to gain your life back through grounding oneself from experience. Live the moment and realize that when you switch back on you didn’t miss a thing at all in switching off. Fight the withdrawal symptoms like checking your email or social media. Ensure that you informed your boss, and your family about your planned off-the-grid-leave so you won’t have to worry about nothing. Finish all your tasks and commitments so your break won’t be interrupted. Prepare your whereabouts without using your techs. Buy a map or print out information sheets about the area. Also, ensure that you plan to do more engaging activities to keep you distracted from using your gadgets. 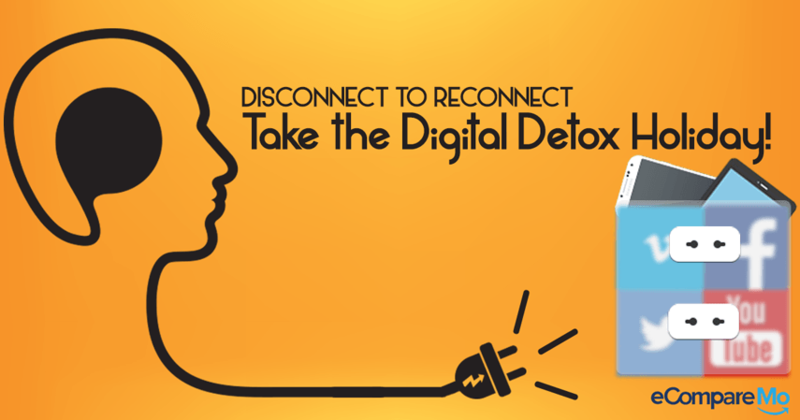 Give your life a breathing room by taking a digital detox! Share your experience by dropping some comments below!